Ukrainian metal enterprises intend to increase steel smelting by 5.9% in May 2018 in comparison with the planned indicators of April, to 1.8 million tonnes from 1.7 million tonnes. 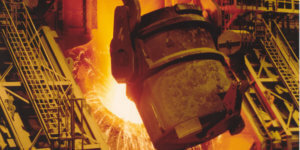 According to the information of the Ukrmetallurgprom association following the results of the balance meeting, the plan for May also provides for the preservation of the total rolled steel production at the level of 1.6 million tonnes and the preservation of pig iron smelting at the level of 1.8 million tonnes. According to Ukrmetallurgprom, in March, the metal companies produced 1.68 million tonnes of pig iron (103% on February), 1.71 million tonnes of steel (106%) and 1.51 million tonnes of rolled steel (107%). In January-March 2018, 15.2 million tonnes of iron ore concentrate (100% compared to the same period in 2017), 7.96 million tonnes of agglomerate (108%), 5.3 million tonnes of pellets (107%), 2.71 million tonnes coke (105%), 5.25 million tonnes of pig iron (108%, taking into account work of the enterprises located in the government uncontrolled areas in January-February 2017, or 120% without them), 5.23 million tonnes of steel (97% and 105% respectively); 4.59 million tonnes of rolled metal (98% and 108%), 269,000 tonnes of pipe products (111%). As of April 10, 19 out of 21 blast furnaces, 7 out of 9 open-hearth furnaces, 12 out of 16 converters, 7 out of 15 electric furnaces and 14 of 14 continuous casting machines were in operation. In March 2018, 2.75 million tonnes of iron ore were supplied to the metal companies (110% on February 2018), in the first three months – 8.025 million tonnes (123% against the same period in 2017, taking into account activity of enterprises in the government uncontrolled areas in January-February-2017, or 137% without them), of which 8 million tonnes are of Ukrainian origin (124% compared to the same period in 2017), and 25,000 tonnes of imported iron ore (37%). Exports of iron ore in March amounted to 2.8 million tonnes (104% compared to February 2018), in the first quarter – 8.6 million tonnes (87% compared to the same period in 2017). In March 2018, scrap collecting companies procured 284,000 tonnes of scrap (102% on February 2018). The demand of the metal complex’s demand for imported scrap metal in the first quarter was covered by 92%.